My favorite flower is probably a gerbera daisy. I love the bright colors they come in, they seem to last quite a long time in a vase compared to other varieties, and something about them is just plain fun. I have been working on a pattern to make some out of paper for quite awhile, and came close to finishing it up for a Craft Wars challenge, but decided to hold off and work on it a tiny bit more to make sure it was just right. Here are my results, let me know what you think! 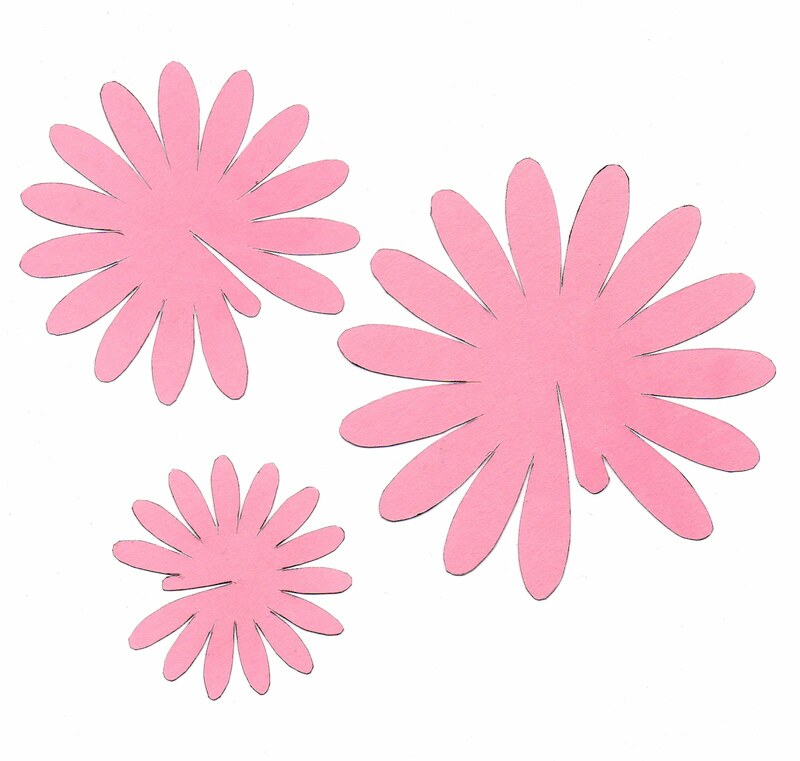 I started by making a template for my petals. Since cutting these out gets rather time consuming (or maybe it's just the fact I always cut these out while doing something else like watching a movie?) I opted to go with only 3 different sizes of petals, cutting 2 of each size to make one flower. You could certainly play with the size on your computer/printer to get more like 5 or 6 different sizes of petal templates and use smaller petals in place of a button center, as I used. I've never seen a flat daisy, so I used my scissors to gently curl each petal a little before gluing my edge tab under. 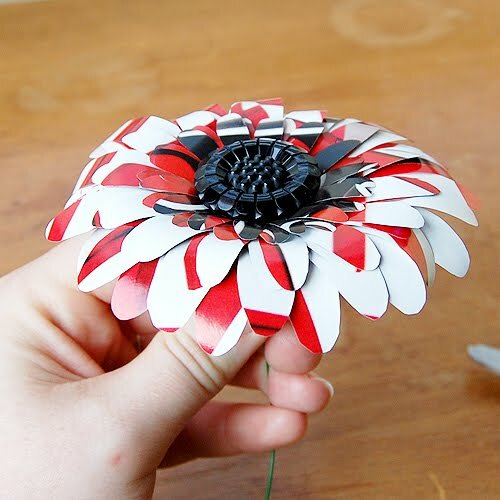 As this daisy is made with magazine paper, not much pressure is needed, and you want to be careful not to tear your petals, as they did just take you awhile to cut out. I will mention, these work pretty great with vellum papers -- I'll get photos of the one I attempted and post it later on, but the fact that these only make a slight cone shape in the center once assembled makes them work well with thicker papers as well as thin. I found these great flower shaped buttons and decided they'd look great with my flowers. 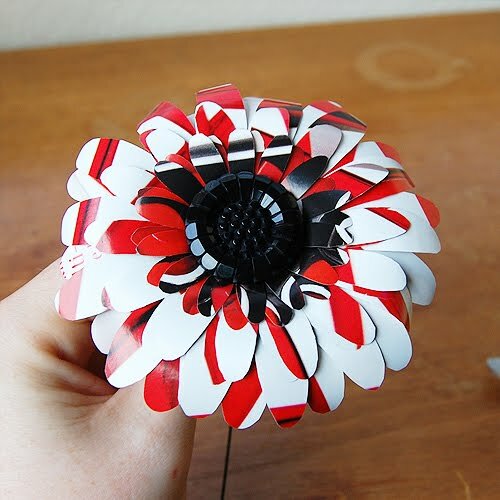 You could use just about any button you like, or if you don't like the button look, attach your button to your floral wire stem, then cover it with a little batting and wrap it in your favorite fabric or some tissue paper. 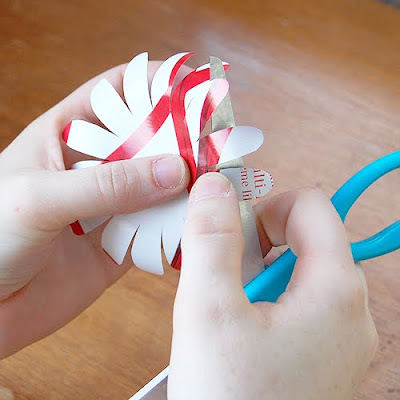 Then start adding your petals on (you will need to poke a small hole in the center of each one before putting it on the wire), arrange them as you like (you may need to add a little glue between each layer of petals to help them stay in place) and wrap the stem in floral tape if you want. I always wrap mine with tape as I think it look nicer, but it is not necessary. If you want to check out more handmade crafts and recipes, visit this link party at Frugal By Choice, Cheap By Necessity. Love these! I've seen similar flowers used for bridal bouquets go for quite a few $$$ on etsy too. I wish I had been crafty enough for my wedding to make such a bouquet. Plus it would last much longer than store bought flowers. Those are pretty cool. Make about 100 in various shades of purple for my wedding, k? Already working on it. I've also found some silvery/ivory vellum I'm doing a few in. I'll be mailing you a package in a week or 2 so you can look through all the papers. Really cute and I love the button you used for the center. Thanks! 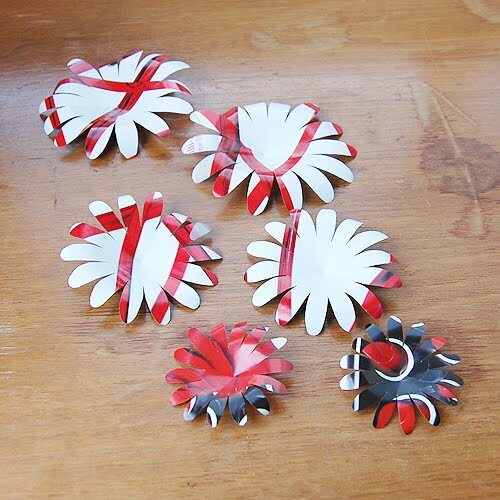 There are quite a variety of buttons out there (both flowery and otherwise) that really work well for these. I ABSOLUTELY LOVE THIS IDEA!!! THANKS SO MUCH FOR THE INSPIRATION!! We also did this when I was a grade school, for school projects and room decors, even in my own room at home! I love doing DIY crafts.